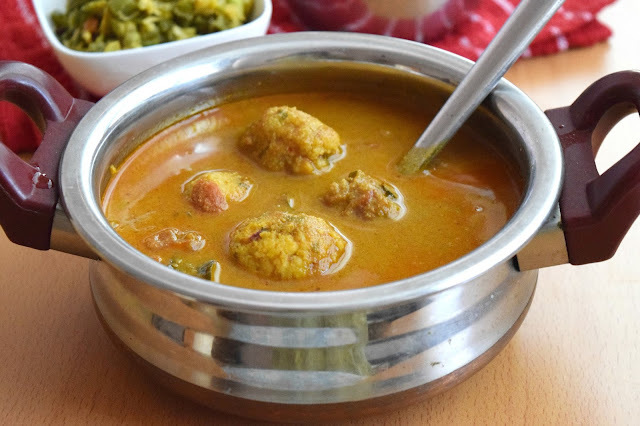 Try this delicious and authentic Tamilnadu style Paruppu Urundai Kulambu / Kuzhambu (lentil balls in tamarind based gravy). Though little effort / pre planning is needed to prepare this gravy; it is worth it. 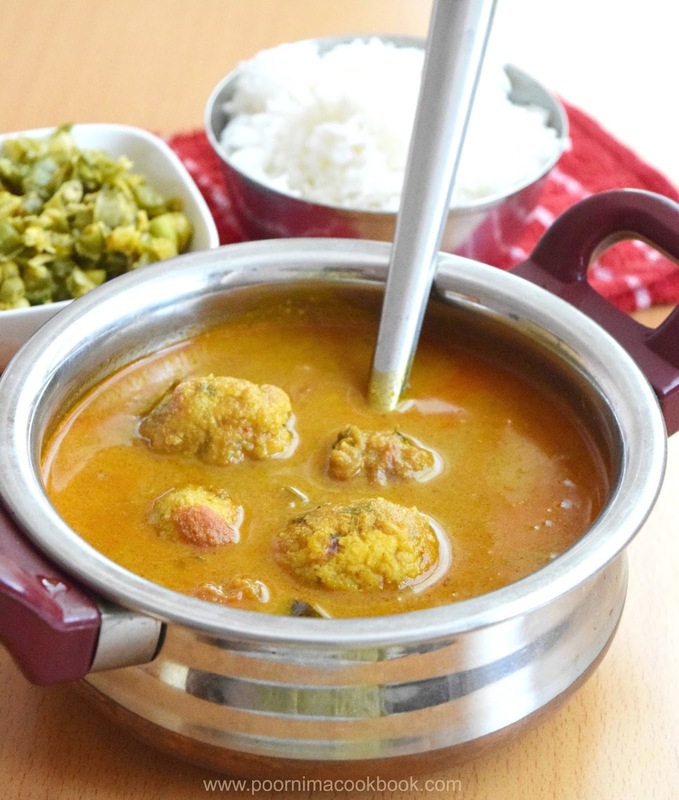 It is one of the favourite dishes in our family. Though this gravy is a perfect to have with steamed rice; it goes well with idli, dosa and chapathi as well. Wash and soak both the dhals in water for 45 min to 1 hr. 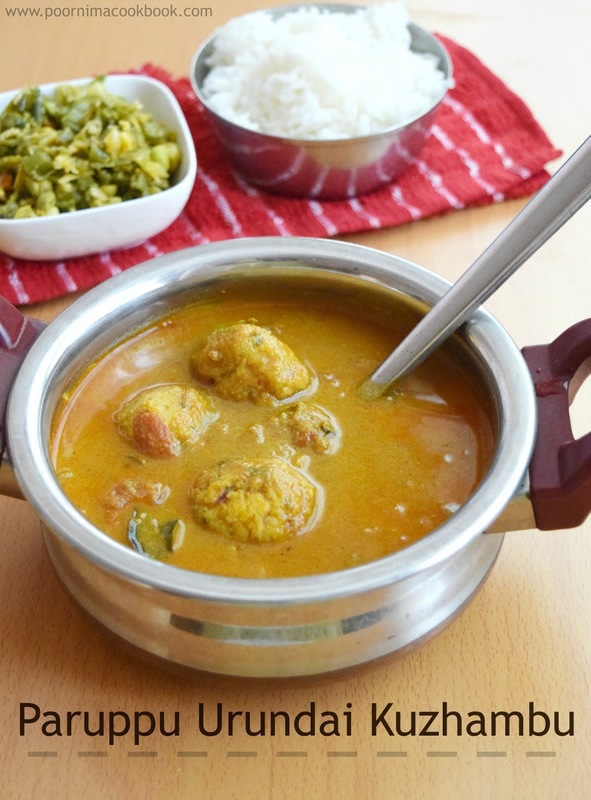 Add garlic cloves, fennel seeds, red chillies and grated coconut in a mixer; grind it coarsely. 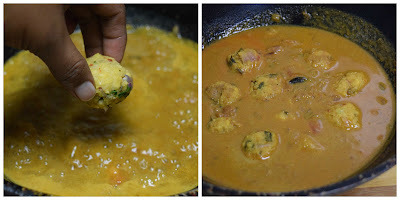 After that add the dhal (drain the water completely before adding), salt and hing to the coconut mixture ; grind it coarsely. Take the dhal mixture in a bowl; add chopped onion, corriander leaves and curry leaves into that. Once it is cooked; allow to cool. 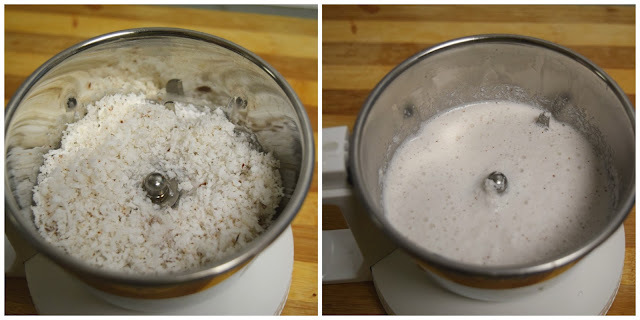 Grind coconut by adding water to fine paste. keep aside. Heat oil in a kadai and season with fennel seeds, fenugreek seeds and curry leaves. Once it splutters, add garlic and onion. Saute till the colour changes; then add tomatoes and salt. And stir well till tomato becomes soft. Then add all spice powders, add tamarind extract and coconut paste along with 1½ to 2 cups water. When the starts boiling, slowly add all the cooked lentil balls. Mix it gently. Close the pan with the lid and allow to cook in a slow flame for 10 to 15 minutes. Once you opened the lid, you will see the lentil balls floating on top and gravy thickens also. Sounds interesting. Thanks for share.